If you’ve got any interest in China, check out the latest Luan Dun – Wieden + Kennedy Shanghai’s semi-regular reports into the weird and wonderful happenings setting the weibos alight. Driving Dogs. I’m not really a dog lover but you can’t help smiling when you hear those two words together. When DraftFCB New Zealand was briefed on a new campaign for New Zealand’s SPCA, the lazy response would have been a sob story about neglected puppies in need of a new home. 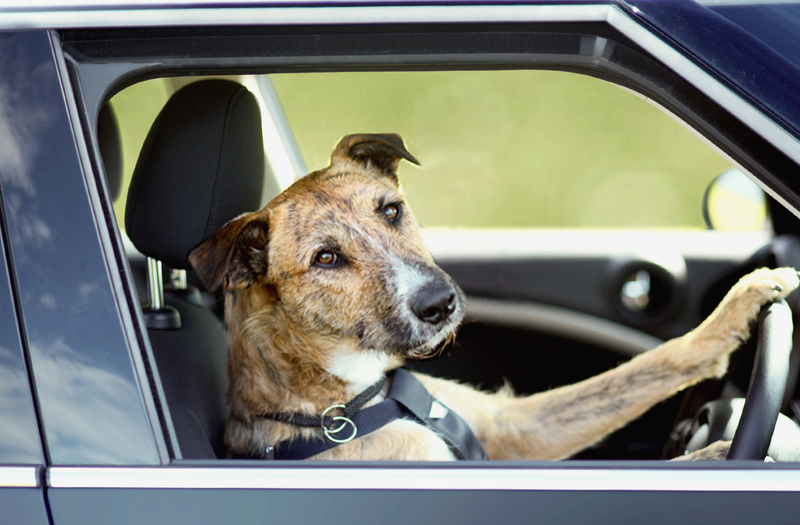 FInd out more about Driving Dogs. 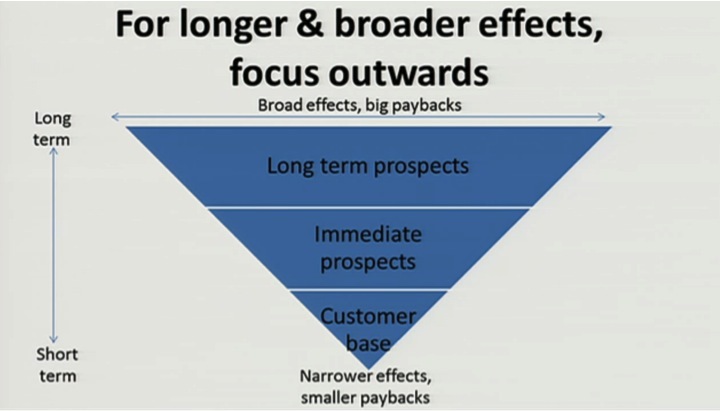 Thanks to @Allan_Blair I was lucky enough to stumble across yesterday’s live stream of the Thinkbox / IPA event: ’Advertising Effectiveness: the long and the short of it’. The keynote was by Les Binet and Peter Field, two guys who are obviously much smarter than most of us, but still manage to talk about marketing in a compelling and straight-forward way. A few years ago they mined nearly a thousand IPA effectiveness case studies for their ‘Marketing in the Era of Accountability’ study, providing hard evidence in support of emotionally-driven fame campaigns over rational persuasion and lazy ‘loyalty’ thinking. Yesterday’s presentation seemed to be more of an evolution than a revolution in their thinking, however, it was still packed full of great observations and recommendations based on updated analysis of the IPA effectiveness databank. It shouldn’t be news to anyone by now that emotionally-driven campaigns are consistently more effective, especially over the longer term. However, there seem to be many clients that still don’t believe this so above is some more evidence for the sceptics, based on Binet & Field’s long-term analysis of the IPA databank. I’m greatly enjoying Daniel Kahneman’s ‘Thinking Fast and Slow’ at the moment so was particularly interested in how the guys applied Kahneman’s thinking to campaign strategy. For those not familiar with the book, Kahneman uses ‘System 1′ to refer to fast, intuitive, emotionally driven decision making, while ‘System 2′ is in charge of the slower, more taxing, rational thought processes. Kahneman’s work gives context Binet & Field’s findings: contrary to our desire to be perceived as rational beings, in fact the majority of our decision-making is emotionally-driven, a product of ‘System 1′. 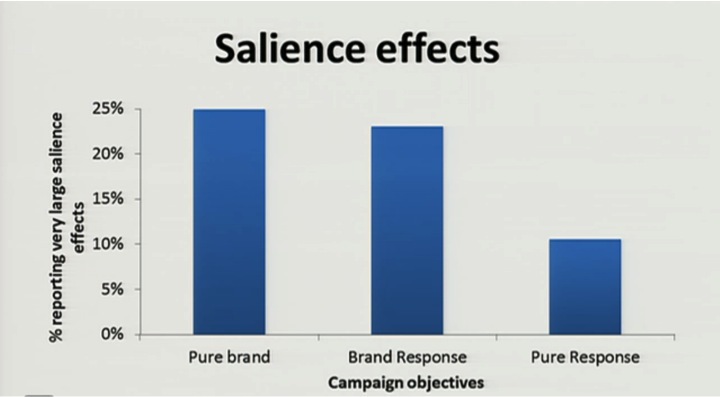 While rational messaging is important at an activation level, without prior emotional priming we’re much less likely to even consider what it’s got to say – the so-called ‘halo’ effect. In fact, in many cases these rational messages actually work by helping us post-rationalise an emotionally-driven decision: “I know the Porsche wasn’t your first choice for a family car, but with a top speed of 200mph it will be handy for getting to hospital in time if the baby comes early”. While the above slide distinguishes between short and long term responses, one of the other key points of the session was the relationship between these objectives. One area where this is particularly important is around price sensitivity. 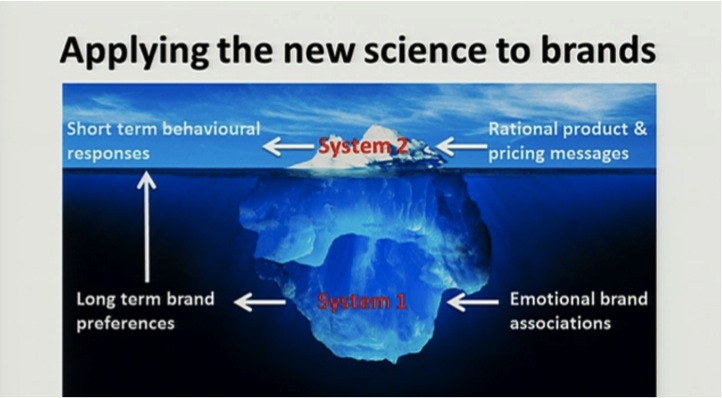 In line with Byron Sharp’s findings, Binet & Field’s research showed that while price promotions can have a short-term positive impact on sales, they have been shown to have a significant negative impact on price sensitivity and brand value over the long term. 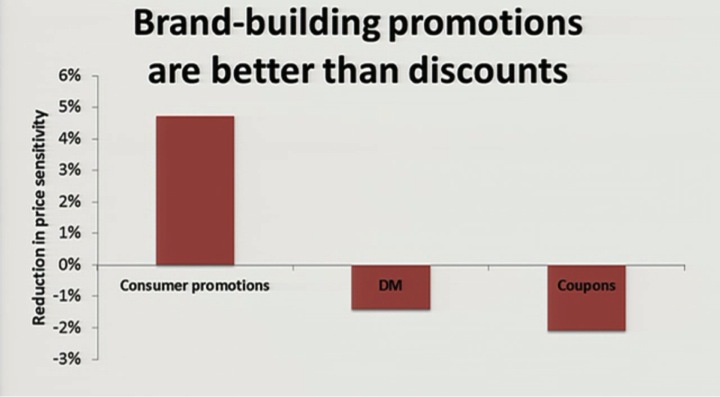 Instead, Binet & Field propose value-added ‘consumer promotions’ such as gift with purchase or competitions as an alternative to discounting. 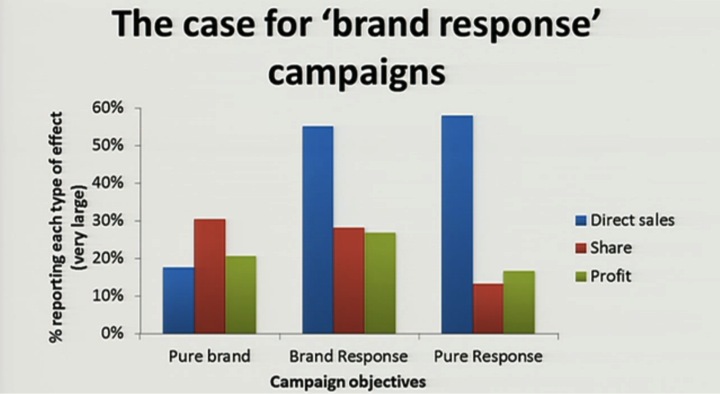 Furthermore, even where the objective is short-term sales, ‘brand response’ campaigns – ie involve a brand-building component as well as an activation component – were shown to be significantly more effective in driving salience, market share and profit than traditional direct response ideas, e.g. rational direct response messages. This seems particularly important in categories like cars where the buying cycle is quite long – just because I’m not in the market for a car now, doesn’t mean I might not buy one in a year’s time. However if the sole focus of advertising is activating those who are ready to buy now with a rational message, it’s wasting the opportunity to influence longer term prospects. One of the most interesting parts of the presentation for digital agencies was around the implications for targeting and measurement. 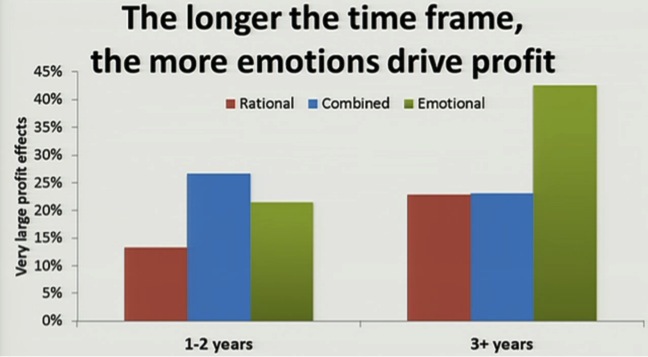 What is clear from the findings is that the most powerful effects of advertising (and I use this in the broadest sense) are only visible over the long term. Furthermore, achieving these large, long-term effects requires broad reach and appeal – a direct challenge to conventional wisdom that obsessive targeting brings greater efficiency. As we saw with ‘brand response’ campaigns, the long-term benefits of building broader brand equity – and ideally fame – significantly outweighs any perceived media wastage. In fact, today’s wastage might be next year’s target consumer, or failing that, an influencer. This poses a challenge for digital agencies, many of whom peddle ‘real-time data’ as the answer to everything and focus on immediately measurable intermediate measures (click-throughs, shares, likes, tweets, direct conversions etc) over long-term brand equity and profit. I’ve touched on a few of the bits I found interesting at the time but this is just a fraction of what was discussed. I strongly suggest checking out the full presentation at Brand Republic. Note: The slides above are all the work of Les Binet and Peter Field so please credit them as required. 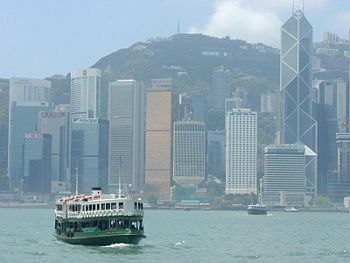 Good news for aspiring planners – we’re looking for a Junior Planner here in Hong Kong to work on Razorfish and Digitas regional clients across Asia Pacific. You might have a couple of years’ experience in a digital or ATL agency, either as a planner or someone who’s keen to become one. Either way, attitude is more important than experience. As this is a regional role, an international outlook is important – the Junior Planner should have an opinion on brands, marketing and culture across APAC. You also need to understand how and why people use digital technology, but not necessarily the technical details. Ideally you have a good foundation in research (desk research, qual and quant, web analytics, social media monitoring etc). However, more important is the desire to apply this, to separate the interesting from the irrelevant, inspire compelling creative ideas and practical strategies. The output of our work is mainly digital, however, it’s not about how many social networks you’re on or using the latest buzzwords (in fact the latter is actively discouraged). We want someone who thinks about people first, technology second – you need to be able to cut through the industry hype. As it’s a Junior role, we don’t expect you to have all the answers on day one but fluent spoken and written English is essential. Cantonese, Mandarin or another Asian language is also highly valued so we’re especially keen to hear from local candidates. Razorfish and Digitas are two of Publicis Groupe’s biggest digital agencies and our APAC team is still growing so there’s plenty of opportunity to develop. We also believe the best ideas happen when you enjoy what you do so hopefully you’ll have a bit of fun along the way. If you’re interested drop me your CV to ben.decastella@razorfish.com, tell us a bit about yourself as well as brief explanation of a campaign or piece of work you particularly like and why. Ta. Hi, I'm Ben. This was my personal blog but I'm now too lazy to update it. After a few years in Sydney (at Razorfish) and Hong Kong (DigitasLBi), I'm now back in London, Planning at VCCP.